ME postdoctoral researcher Lucas Ting has won the 2013-2014 Western Association of Graduate Schools (WAGS) and University Microfilms International (UMI) Innovation in Technology award for his PhD dissertation. This award is intended to recognize a thesis or dissertation for the development of an innovative technology and its utilization for the creative solution of a major problem. Dr. Ting’s research investigates how endothelial cells, while line the inside of blood vessels and platelets, react to physiological & pathological fluid forces by measuring changes in the cells' mechanical properties, adding insight into how issues such as atherosclerosis & coagulopathy develop. The UW microgravity team, the AstroDawgs, has been accepted into the 2014 NASA Microgravity University Program. This program provides a unique academic experience for undergraduate students to successfully propose, design, fabricate, fly and evaluate a reduced gravity experiment of their choice. The AstroDawgs will pursue an experiment to characterize the impact of different conical geometries on lunar regolith and the resulting dust cloud in a microgravity environment, in order to find a geometry that will produce the lowest dust cloud. Brian Fabien, ME Professor and faculty advisor for the EcoCAR2 project, has been awarded the DOE Applied Automotive Engineering Fellowship in recognition of his contributions to the AVTC Applied Automotive Engineering Curriculum Project (AAECP), a project designed to leverage the knowledge and expertise of EcoCAR 2 faculty advisors to create a body of practical automotive engineering knowledge that is gained through hands-on vehicle competitions. The newly established DOE fellowship is applicable only to EcoCAR2 lead faculty advisors. It includes a $10,000 award that Dr. Fabien may use towards UW’s AVTC program. Congratulations, Dr. Fabien! Recent ME grad Thomas Larson was awarded 3rd place for his presentation on Cell Phone Microscopy at the ASME "Old Guard" Oral Presentation Competition during the ASME International Mechanical Engineering Congress & Exposition (IMECE) in San Diego on November 16th. Congratulations, Thomas! Click here to read more on the exciting work that Thomas has been doing to develop a simple but powerful microscope for smartphones. UW’s EcoCAR 2 team is in the third and final year of a nationwide college of engineering student challenge to re-engineer a Chevy Malibu to reduce its fuel consumption and limit greenhouse gas emissions. The competition, developed by the U.S. Department of Energy and General Motors, aims to educate and produce the next generation of automotive engineers, or as professor of Mechanical Engineering and EcoCar 2 faculty advisor Brian Fabien says, the people who are going to save us. Assistant Professor of Mechanical Engineering Kat Steele is featured in this Seattle Times article about the changing culture for women in engineering. Professor Steele says that the number of women on the faculty played a big role in her decision to work at the UW. UW has seen steady growth in the number of women in engineering and science faculty positions since it received a national grant to help boost the numbers. Mechanical Engineering PhD student Jeff Campbell is researching how the shape of terrain park jumps determines how people end up in the air and how often they get unintentionally inverted. Currently, Campbell says, ski jumps are built with a disregard for biomechanics. He is working with Guidance Engineering, a Seattle based company, to track the body mechanics of ski jumpers. They plan to use their findings to make ski jumps safer by providing better design tools to terrain park crews. ME Professor Dayong Gao (back row, center) was selected as one of the nineteen well-respected American engineers, scientists and executives who received the national honors in four categories of "2013 Asian-American Engineer of the Year (AAEOY) Award," as a part of the 2013 National Engineers Week program. Congratulation letters from US President Obama, government officials, and congressional leaders were presented during the 2013 AAEOY Award Ceremony. For the second year, Washington Open Object Fabricators (WOOF) entered a 3-D printed boat in this year's Seafair Milk Carton Derby. The new boat represents a better understanding of how to print with recycled plastic, said Dana Henshaw, a student and director of operations for WOOF. The boat required fewer recycled bottles. It was printed over 11 hours instead of 19 hours, by using a different nozzle that extruded a thicker line of plastic. "We fail a lot, but we learn a lot," said student Mark Hanson, who thinks in the future every neighborhood might include a couple of 3-D printing shops stocked with barrels of the raw plastic needed to make almost anything. Lucas Ting and Shirin Feghhi, shown with ME Associate Professor and advisor Nathan Sniadecki, both took home 1st place awards for presenting their papers at the 2013 ASME Summer Bioengineering Conference. Out of 180 abstracts submitted for the PhD competition, 36 finalists were divided into six sessions and Lucas and Shirin each won their respective sessions. Formula SAE gas- and electric-powered cars win 1st and 2nd in national contest! Professor Ramulu Mamidala received the 2013 ASEE Isadore T. Davis Award in recognition of his spirit and leadership in the collaborative efforts of engineering or engineering technology education with industry. Prof. Ramulu was recognized for his exemplary collaborative efforts motivated working engineers to pursue doctoral studies and he is a leader in using emerging technologies in distance education to reach non-traditional students. American CryoStem Corporation welcomed ME professor Dayong Gao to its Medical & Scientific Advisory Board. Dr. Gao will provide guidance and enhancement for the company's development and commercialization efforts. In an article about the proliferation of 3-D printing, ME professor Mark Ganter lauds the WOOF team and the ecological benefits of 3-D printing. "If you knew you could 3-D-print a boat out of garbage and knew it meant that trees wouldn't have to get cut down, isn't that worth doing?" Ganter said. GeekWire introduces Pure Blue Technologies, grand prize winner in this year's UW Business Plan Competition. The company is developing a system that uses visible light photo disinfection technology to process contaminated water -- for example, water used in the oil and gas industry -- and make it available for beneficial reuse. The team includes Michael Lee, MS Mechanical Engineering, and members from other UW Engineering departments and colleges. ME Associate Professor Jae-Hyun Chung led the research and collaborated with NanoFacture, a Bellevue Wash. company, to create a device that can extract human DNA from fluid samples in a simpler, more efficient and environmentally friendly way than conventional methods. Chung is pictured with Washington Governor Jay Inslee during a licensing ceremony involving the UW start-up Nano Facture and KNR systems; Chung is the inventor of the involved technology. Chris Bassett will be recognized for his efforts to combine academic scholarship with social awareness and concern, as well as his contribution to redefining the value of a doctoral degree at the Graduate Council Meeting on May 16. Bassett is mentored by Research Assistant Professor Brian Polagye. Professor Ramulu Mamidala has been awarded a 2013 ASEE Isadore T. Davis Award in recognition of distinguished accomplishments in engineering education. Congratulations to Prof. Mamidala, who recently received the Boeing Pennell Professorship in Mechanical Engineering endowment! Two ME Freshmen to Present Research Findings in D.C.
Six UW engineering students — including two ME direct admission students Kasey Acob and David Coven — have the rare opportunity to present their research at a research and innovation conference on March 9. 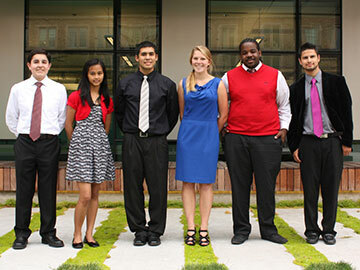 They conducted the research during an NSF research and mentoring program the summer of 2012. Students spent 40 hours per week working on the "Towards zero-energy buildings based on energy-harvesting electrochromic window and thermoelectric systems" EFRI grant with principal investigator and ME professor, Minoru Taya, co-principal investigators, and their graduate students. Associate professor Jiangyu Li, working with researchers at Southeast University in China, has discovered a remarkable molecule that shows promise as an organic alternative to today's silicon-based semiconductors. Cheap, flexible, and nontoxic, the molecule is well suited to a wide range of applications in memory, sensing and low-cost energy storage. Findings are published in the journal Science. Microgreen Polymers, which grew out of ME professor Vipin Kumar's Microcellular Plastics Lab, has received a $5 million investment from the Stillaguamish Tribe to help expand manufacturing and add over 200 jobs. The company makes food and beverage containers from recycled plastic.